Travelling with a group isn’t the same as other types of travel – you’ve got a bunch of people to look after! This can make it a busy trip, but there are lots of ways you can prepare. Make sure you check all of your group’s dietary requirements. 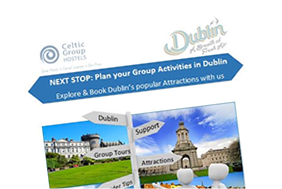 Let your agent and the hostel know in advance so they can cater for your needs while you’re here in Ireland. To avoid disappointment when planning the trip, have two sets of dates you can travel on. Also, keep in mind that if you travel midweek you’ll get much better rates in the hostels. Let your agent know what the male/female breakdown is so they can try to organise to be accommodated in the same rooms or separate rooms. It’s a good idea to factor in lunch breaks when planning out the day. The most cost effective way is to organise packed lunches. There are two ways organise this – you can either go to the supermarket for supplies and make your own, or we can arrange this for you ( must be pre-booked in advance) and get them delivered to your hostel on the days that you require them – get in touch. A great way to get to know a city is on a walking tour, particularly if it’s your first visit to a city. We know several walking tour companies so we can book it for you. To avoid disappointment, and not to mention queuing, it’s good to pre-book tickets for the main attractions before you get to them. If you need assistance with this, just contact us. Prior to departure, ask your group to make a copy of their passports. Next, when you’re here in Ireland, collect all the copies and keep them in a security deposit box. Make sure the parents of your group have contact details of the hostel. This way, if for some reason they can’t get in touch with you directly, they can contact the hostel directly. If there’s a medical emergency, you might not have to rush the patient to hospital – you could just ring the ‘Doctor on Call’ instead. In Ireland, the number is 1850 777 911 which is a low-cost number. It might not work from your mobile phone, so if you need to ring it ask your hostel to ring the number for you. Is anybody in your group taking medication? Will anybody need to go to a pharmacy to get medication when you’re in Ireland? If so, will they have their prescriptions with them if you need to buy any medication when you’re here? These are questions you need answers for before departure. Ireland’s cities might not be the biggest cities in the world, but you can still get lost in them. To avoid this from happening, agree on a meeting point every time you split up. This way if anybody gets lost they’ll know exactly where to go.